Various strands of research related to environmental issues and sport are being explored through the CSS. The first strand relates to the study of golf and environmental issues. 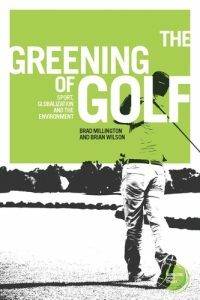 Ongoing research emerged from a SSHRC grant led by Brian Wilson entitled “Corporate Environmentalism and the Canadian Golf Industry: Examining Industry Responses to Social, Cultural, Economic, and Political Pressures Related to the Environment.” A book entitled The Greening of Golf: Sport, Globalization and the Environment (2016, Manchester University Press), co-authored by Brad Millington, included a series of chapters and articles on the topic. The second strand relates to environmental issues and sport mega-events, with a particular focus on how environmental issues are promoted by sport mega-event promoters — or what Wilson and Millington refer to as ‘Sport Management Environmentalists’ (or ‘SMEs’) (see Wilson & Millington, 2015 –Sport and Environmentalism, in R. Giulianotti (Ed. ), Routledge Handbook of the Sociology of Sport). The third strand relates to how sport-related environmental issues are portrayed in media. This research, conducted with doctoral candidate Liv Yoon, is ongoing — and is also part of the ‘Sport Journalism for Peace’ project. Yoon, L. (2017). To See the World through a Mountain: Mount Gariwang and the 2018 PyeongChang Olympic Games. The Society Pages: Engaging Sports. Wilson, Brian & Millington, Brad. (2017). Sport, the Environment, and Physical Cultural Studies. In M. Silk, D. L. Andrews & H. Thorpe (Eds. ), Routledge Handbook of Physical Cultural Studies (pp. 333-343). New York: Routledge. Millington, Brad & Wilson, Brian. (2017). Contested Terrain and Terrain that Contests: Donald Trump, Golf’s Environmental Politics, and a Challenge to Anthropocentrism in Physical Cultural Studies. International Review for the Sociology of Sport, 52(8), 910-923. Millington, Brad & Wilson, Brian. (2017). The Masters Golf Tournament: Media Mega-Event, the Environment and the Emergence of Augusta National Syndrome. In A. Billings & L. Wenner (Eds. ), Sport, Media and Mega-Events (pp. 142-155). London: Routledge.